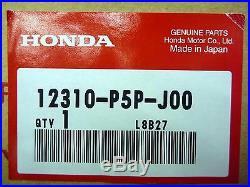 This is a 100% Genuine Honda part. We are a flagship Honda Dealer. Check out our feedback. Please confirm part number/size/application with your dealer or other resource before ordering. And do not open until you have made sure it will fit. Parts name COVER COMP. 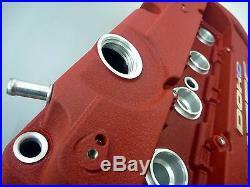 CYLINDER HEAD Genuine JDM Factory Prelude Type S RED valve cover. 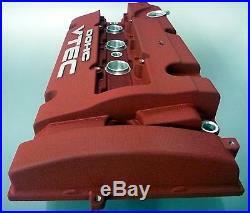 Originally designed for the Japanese Domestic Market Prelude Type-S. Will fit all H22 Honda Prelude/ Accord Euro R Engines. 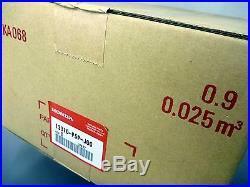 BRAND NEW in JDM Honda packaging. 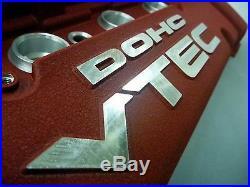 Looks great in any engine bay and your JDM friends will NOTICE this and ENVY U for SURE! DISPLAY THE TRUE COLORS of HONDA’s TYPE-R series to show your dedication to Honda Power! 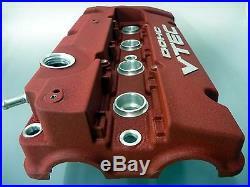 This JDM valve cover even differs from the U. 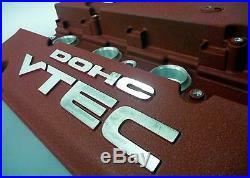 Model in that “VTEC” is the priority lettering versus “DOHC” on the U. Features a high temperature wrinkle finish coating for durability with CNC-machined logos. Made by Honda Japan. 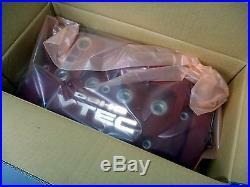 Note:Compatible with all H-series VTEC engines. Don’t miss this chance! H22 was the first engine from H-Series family. All H22 were equipped with VTEC, Dual Over Head Cam (DOHC), belt-driven four-valve-per-cylinder head with PGM-FI multi-point injection system and a distributor ignition system. Using 87mm bore and 90.7mm stroke all H22 engines were displacing 2156cc. H22 made its debut with JDM Prelude Si VTEC in late 1991 as H22A. H22 has evolved during its life span. Starting from 1994 all H22 have recieved a special lining on cylinders blocks named FRM (Fiber Reinforced Cylinder Wall)FRM is a thin yet very strong lining material. FRM is inserted into the cylinder casting when molded. 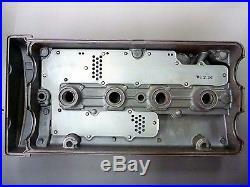 After the casting is cooled, the cylinder block is bored, leaving a thin lining material on the cylinder wall. Results are very tough cylinders that can put up with extreme conditions. In 1997 H22 engines recieved another major update, closed deck short blocks were replaced with open deck ones. Total of 9 versions of H22 engines were produced. They were named, H22A (this code for used two different engines), H22A1, H22A2, H22A3, H22A4, H22A5, H22A7 and H22A8. Besides the major updates mentioned above, these versions were slightly different from each other with their compression ratios, cam profiles, and intake-exhaust ports. The last and the most powerfull version of H22 was again named H22A. This version was used in JDM Prelude Type-S , JDM Prelude SiR S-Spec and JDM Accord/Torneo Euro-R. JDM H22A had 11.0:1 compression pistons, a ported head, larger throttle body, wilder camhafts, a low restriction intake system and improved exhaust. With 217hp output, H22A was the most powerfull version of H22 engines as well as entire H-Series engines. The red valve cover was the distinctive mark of those engines. 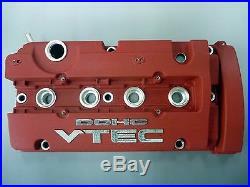 The item “JDM HONDA Genuine RED Valve Cover Prelude Type-S / Accord Euro-R for H22A-series” is in sale since Tuesday, October 25, 2016. 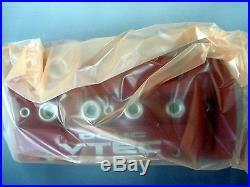 This item is in the category “eBay Motors\Parts & Accessories\Car & Truck Parts\Engines & Components\Valve Covers”. The seller is “steprise” and is located in Tokyo. This item can be shipped worldwide.